The onset of Darwin’s cyclone season coincided with the extinction of our cruising budget. That we were broke was no surprise, as we’d always known that our little pot of money was going to run out in November 2009. We had originally hoped to have got past Darwin by then, cruising the Kimberleys and then finishing up by selling Pindimara in Perth, but that wasn’t the way that it worked out. Cruising is like that. You stop where it looks interesting and stay as the weather and your whims dictate; timetables are vague and often thrown out of the window. We had had a spectacular year and were more than satisfied with everything that we had achieved. Having secured a (hopefully) cyclone-proof marina berth, we now had to decide between returning the following Easter to complete the voyage, and selling her right there in Darwin. In either case, we were committed to paying monthly marina fees at least until the end of the cyclone season, so we had to first find gainful employment. We could, I suppose, have picked up lucrative contracts in our old discipline of computer programming, but despite the obvious financial incentives, that would have felt like a step backwards from our new lives. 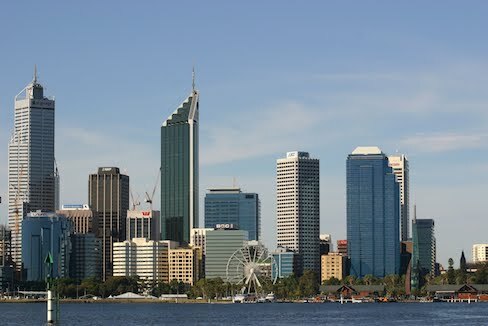 Over the year we had gently pursued other opportunities, and both had at least tentative offers of employment in Perth, about 1500 miles away down the west coast, and so after a quick jaunt to Europe to visit friends and relatives we relocated to Western Australia. From research on the internet we’d already decided which suburb we wanted to live in, so we checked into a cheap hostel nearby and went out on foot to find an apartment. It didn’t take too long to visit every realtor in the area and to determine the minimum rent that we should pay for a unit in reasonable condition. We saw some lemons, of course, but gradually increased our range in increments of $50 rent per week until we found one that wasn’t actively falling down, at which point we rented it. Cruising had fundamentally changed the way that we looked at houses. Even the smallest was far larger than Pindimara, so we weren’t especially interested in the size of the lounge or the number of bedrooms. We were only anchoring for a while, not making a purchase, so we didn’t pay much attention to decor. We just looked for a few simple criteria: gas cooking, good natural lighting, and a sensible use of the cooling Fremantle Doctor wind that blows every afternoon. The first flat that we found that fulfilled all of these simple criteria, we took. Furniture was easy, with simple functionality being the order of the day: cheap table, chairs, desk, sofa, and an expensive mattress. Having spent the previous year storing all our fresh food in a 42 litre Engel outback fridge, we ignored the monstrous walk-in fridge-freezers on display and purchased a small bar fridge instead. Our only real concession to land-bound life was to buy a simple washing machine. 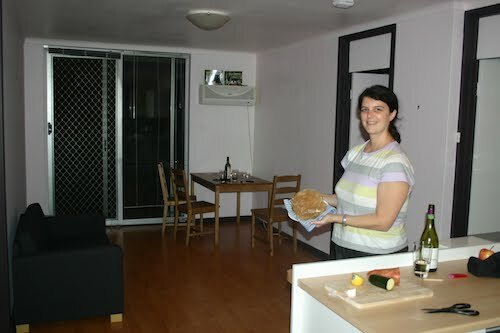 Within a week of arrival, we had somewhere to live, a bicycle for transport, and the promise of jobs. This entry was posted in Australia, Oceania, Travel, Voyage of Pindimara and tagged Darwin, Perth, Sail on 2009/12/23 by Reinhard.